From the hundreds of amateur and professional chefs who aspire to make a mark on the kitchen battle in our country, they are down to 12! Yes, these 12 chefs will be the finalists of the SM Hypermarket's Super Chef 2010 and one of them will get to take home Php100,000 worth of Kitchen Showcase and a chance to fly to Singapore for a 4-day all-expense-paid trip for a culinary training. Runner-ups will also win a Php50,000, Php25,000, Php15,000 or Php10,000 SM Gift certificates. So, who are these 12 finalists? Eddieson de Ocampo is from Baliwag branch, Reynilo Peña is from North Harbor and Dante Cabalona is from Marilao and from Novaliches branch is Aiza Mesina. While the competing the chefs from the Southern branches are Islagel Gellidon, Leah Alava, Angelo Cervantes, and Louie Dumangas. Islagel Gellidon has a catering business and also trainer to all aspiring entrepreneurs at TESDA. While Leah Alava is a housewife who think that her 4 children are her best and worst critiques. However, Angelo Cervantes is BA in HRM graduate of ollege of St. Benilde, and this 23-year-old hopes to own his own restaurant in the near future. And from Las Piñas branch, Louie Dumangas is a line chef at TGIFriday’s and aspires to become an executive chef at his own restaurant someday. And for our last batch of finalist, they came from the Central District branches, and they are Mark Anthony Mejino, Eric Dizon, Josephine Portulin and Roselle Manzano. 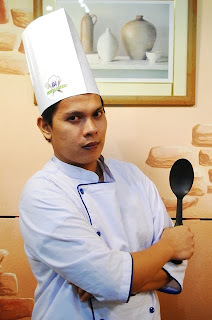 Came from Mandaluyong City, Mark Anthony Mejino is a culinary student of the Culinary Institute of Aristocrat and an Italian restaurant aspirant. While from the Pasig City, comes Eric Dizon, a current Assistant Head Chef at Gerry’s Grill in Pasig and soon-to-be a Head Chef at Gerry’s Grill! Good job, Eric! And from the Mall of Asia came Josephine Portulin, an educator from Lucena, majoring in Economics who just she discovered that she has a gift for cooking. Great, isn't it? And last but not the least, from Eton branch, we have Roselle Manzano, a 3rd place winner of at ABS-CBN’s National Food Showdown last September 2009. She is also a dietitian and a nutritionist who works as a corporate chef at Trilogy. You can catch these super chefs on Asian Food Channel every Wednesday at 6:30 in the evening and catch the hottest and sizzling happenings as they battle it out in the kitchen and be reigned as the SM Hypermarket's Super Chef 2010. As we all say, LET'S GET IT ON!